Moscow is still the world’s most congested city according to the 2018 Global Traffic Scorecard that is published annually by mobility analytics services provider Inrix, with the company identifying and ranking congestion in more than 200 cities, across 38 countries. 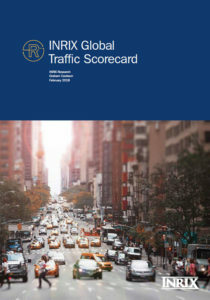 The key findings of Inrix’s annual Traffic Scorecard provide a quantifiable benchmark for governments and cities across the world to measure their progress to improve urban mobility and track the impact of spending on smart city initiatives. 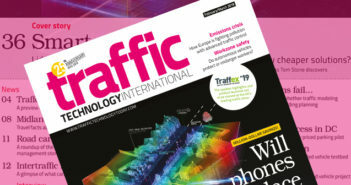 For its latest study, Inrix analyzed 500TB of data from 300 million different sources covering over five million miles of road. The company notes that the 2018 Global Traffic Scorecard is not directly comparable to the 2017 Scorecard due to different metrics and criteria of analysis, as last year’s edition measured time spent in congestion for the median commuter, whereas the latest version not only analyzes time lost, but also the severity of congestion. At the global level, Moscow topped the list of the world’s most gridlocked cities, with 210 hours lost due to congestion (when weighting for population), followed by Istanbul (Turkey), Bogota (Colombia), Mexico City and São Paulo (Brazil). Based purely on time lost in congestion, Bogota tops the list at 272 hours. The report notes the dominance of Latin American cities due to their rapid urbanization and topographies. 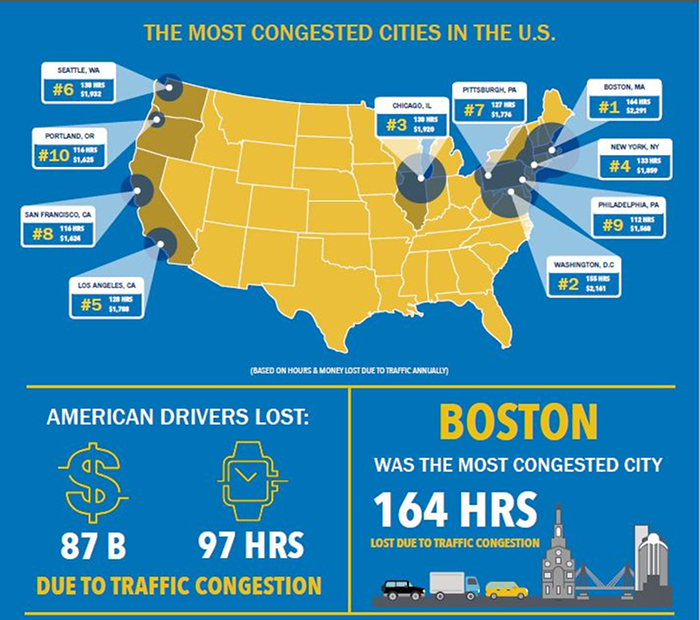 Boston was the USA’s only representative in the top 10 most congested cities in the world. In the USA, the 2018 Scorecard analyzed congestion and the severity of it in the top 60 urban areas. The country’s motorists lost an average of 97 hours a year due to congestion, costing them nearly US$87bn in 2018, an average of US$1,348 per driver. Boston (164 hours lost due to congestion) and Washington DC (155 hours) ranked as the two most congested cities, with over 15 hours per year more than the next worst. While notorious for its congestion, Los Angeles’ constant gridlock does not have the severity as the other top-ranked cities due to its sprawling geography and massive road network. New York City was also one of the country’s most congested metropolitan regions, with the ‘last mile’ taking drivers seven minutes. In contrast, Los Angeles (four minutes) has employment across a wider geographic area, preventing severe downtown congestion experienced in more centralized cities. 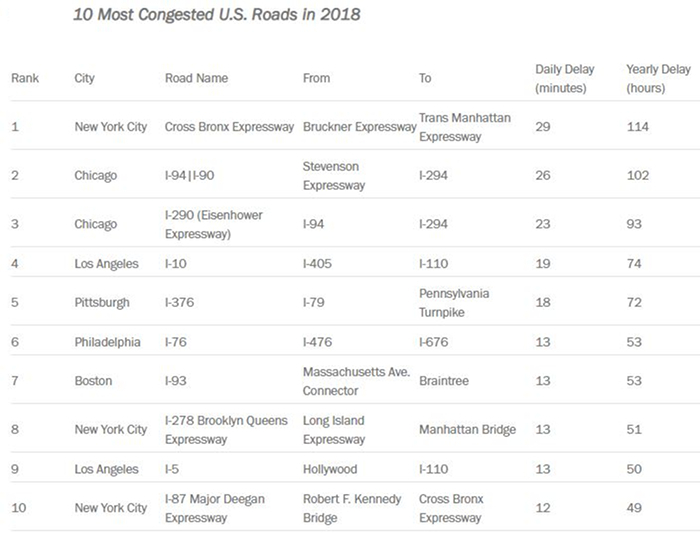 For the fourth year in a row, the Cross Bronx Expressway (I-95) in New York City tops the Most Congested Corridors in the USA list, with drivers wasting a total of 114 hours per year at peak hours in congestion. Surprisingly, Washington DC, number two in the most congested cities ranking, does not have any corridors that appear on the list. Despite extreme levels of congestion, traffic is diffused across the region and concentrated to on major arterials.